This article is about the Imperial version of this mission. For the Stormcloak version, see The Jagged Crown (Stormcloaks). Find the Jagged Crown for the Imperials. After you join the Imperial Legion, talk to Legate Rikke. Meet up with Rikke and enter the ruins. Find your way into the tomb. After taking the oath to join the Imperial Legion, General Tullius will offer you another mission. After talking to Legate Rikke, she will ask you to meet her just west of the ruins of Korvanjund. When you arrive, she will be discussing the upcoming battle with a small group of soldiers. As you approach, Hadvar will talk to you, explaining he is glad to be fighting with you, but that the Stormcloaks are not his biggest concern, hinting that the ruins don't want them to be there. The conversation ends and Legate Rikke will prompt the start of the quest. Move with the other soldiers up the hill and down into Korvanjund. 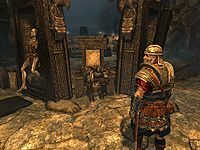 Fight your way through several Stormcloaks and proceed up the stairs for another brief conversation with Legate Rikke, then open the doors to the Korvanjund Ruins. Once inside the Ruins, wait for Legate Rikke's signal to charge the Stormcloak guards standing at the top of the stairs. There are only four and they go down relatively easily. Continue down the stairs through a hall and into another room where you will find two more Stormcloaks up the stairs to the right. Follow Legate Rikke back to the entrance to a tunnel to the left of the entrance to the room. She will instruct you to find another way to proceed in order to avoid an ambush. Go back up the stairs and follow the catwalk counterclockwise around the room. Find a doorway that leads to a sky bridge above a room containing two Stormcloaks. Once you start fighting them, the Imperial soldiers will come running in to aid you. On the eastern end of this room there are more stairs, at the top of which is a chest and the Light Armor skill book Jornibret's Last Dance. The Imperial soldiers will push through to a tunnel on the left side of the room on the backside of the landing. Make your way down the tunnel and fight a few more Stormcloaks in a small room filled with burial urns. Legate Rikke and the Imperial soldiers will stop over a draugr and converse before moving on through the tunnels. Open the doors to Korvanjund Hall, where you will find another dead draugr along with a dead Stormcloak on the stairs. Take the stairs up and dispose of the one living Stormcloak before proceeding along the walkway and into another tunnel to the left. Find another lone Stormcloak to kill before reaching a fork in the tunnel. The tunnel to the left contains a swinging blades trap. Follow Legate Rikke straight down the tunnel into the Hall of Stories, which shows the history of the ancients who built Korvanjund. At the end of the hall you will find several dead Stormcloaks in front of a door. Pick up the Ebony Claw from the floor directly in front of the door. Like all claws, examining the symbols in your inventory will reveal the combination necessary to open the door (top to bottom: Fox—Moth—Dragon). Insert the claw into the door and proceed. Pass through a small gold door into a large room. To open the metal gate blocking your path, find the hall on the right side of the room and take the stairs leading to a walkway around the upper level of the room. Take the bridge across the room to an alcove; the handle that opens the gate is on the left side of the wall near a pedestal with a dagger on it. Activating the lever will also trigger several draugr to emerge. Kill them to proceed through the now open gate. Note that If you take the dagger off the pedestal, a secret passage will open, revealing a tunnel to a room containing an adept-trapped large chest. Open the door to Korvanjund Crypt and take the tunnel into a large room. 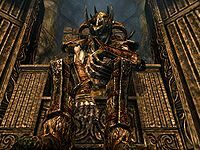 As the Imperial soldiers spread out, approach the leveled draugr sitting hunched over on the throne. Hadvar will note the crown on his head and two leveled draugr will emerge from either side of the throne. Complete the quest by killing all of them and retrieving the Crown from the draugr's body. Legate Rikke will then send you to deliver the Crown to General Tullius. Behind the throne there is a chest, and at the back of the room there is a Word Wall for a word of the shout Slow Time. Once you have the word, turn around to find a staircase to a tunnel that leads to Korvanjund Temple. Lift the bar off the door and open it, then turn right and head for the exit. Head back to Solitude and give the Jagged Crown to Tullius. He will immediately give you the next quest, Message to Whiterun. No reward is given on this quest only a, "Good work, soldier" from General Tullius. You can still switch sides by taking the crown to Ulfric Stormcloak and joining them. Even if the crown is given to Ulfric, the journal will still say you gave it to Tullius. Even if you do not kill the Stormcloaks outside Korvanjund, they will be dead once you have cleared the ruins. It is possible that Legate Rikke does not spawn outside the ruins. This is fixed by advancing on your own and clearing the first area of Stormcloaks. The quest will update and Legate Rikke will appear at the second spawn point. Also fixed by simply using console commands to move her to the meeting point and the quest will proceed as normal. In such a case, load a previous save file and let all dialogue take place before proceeding. 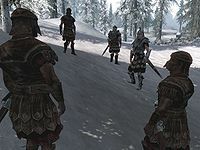 Hadvar and the other Imperial soldiers will address you as Dragonborn even if you have not yet progressed the Main questline past the point at which the Greybeards announce it. Sometimes the Jagged Crown will not appear on the draugr's body. This can be caused by attacking and killing the draugr before Legate Rikke speaks of the crown. Load an earlier save, such as the autosave made on entering the crypt. The draugr will often appear to be wearing the Jagged Crown on top of another helmet. It is possible that you won't be able to enter the ruins as it will be caved in. Sometimes your group of soldiers may not enter the ruins, and instead stand outside with their weapons drawn. ? In such a case, simply enter yourself, and they should follow. 10 I've decided to join the Imperial Legion in its fight to preserve the Empire. I should talk to Legate Rikke to get my first assignment. 30 I've decided to join the Imperial Legion in its fight to preserve the Empire. My first assignment is to help Legate Rikke recover the Jagged Crown from the ruins of Korvanjund. The following empty quest stages were omitted from the table: 0, 1, 7, 20, 40, 42, 43, 45, 54, 60, 61, 62, 63, 65, 70, 78, 80, 81, 100, 102, 103, 105, 110, 120, 130, 135, 140, 150, 160, 162, 170, 171, 172, 174, 175, 176, 178, 190. On the PC, it is possible to use the console to advance through the quest by entering setstage CW02A stage, where stage is the number of the stage you wish to complete. It is not possible to un-complete (i.e. go back) quest stages, but it is possible to clear all stages of the quest using resetquest CW02A. This page was last modified on 12 November 2018, at 21:04.